Splinter rescued Lynda while the tiny Turtles battled the super-powered thugs. Unfortunately for the young terrapins, their bo staffs were no match for the robotic exoskeletons’ abilities, and each weapon was quickly broken. The villains noticed Splinter had taken Lynda, and they rushed after their quarry. Mike took two pieces of his broken staff and tied them together so they resembled nunchakus and threw them. The handles wrapped themselves around one thug’s ankles and he fell into the others, sending all four sprawling down a long and winding stairwell. One hoodlum turned and sent a spray of fire out of his glove up the stairs towards the Turtles. The blaze lit the Turtles’ overcoats on fire and they dove through a door and rolled until the fires were out. They quickly discovered that they were in the weaponry area of the building. As the crooks faced Splinter and the fallen form of Lynda, the Turtles erupted through the burning building with their trademark weapons now in hand. Armed with better equipment, the mutants quickly dispatched their foes. As Lynda awoke, Splinter and the Turtles ran for cover, while the woman lamented that she didn’t get a chance to thank them. Later, it was discovered that a local contractor, Don Tower, was behind the fires that were decimating the neghborhoods that Slujjcorp had designs upon. As the police hauled Tower to jail, TV reporters and firemen arrived on the scene. Lynda told the press that she wanted to thank the mystery men who had helped her. Suddenly, Shelton Slujj arrived on the scene and told Lynda that his corporation had no idea what Tower was up to and promised to pay for the damage done to her business and that he would rework their plans so the skyscraper would not impede on her business. After everyone left, Lynda stood looking forlornly upon her property. Talking aloud, she thanked whoever had helped her, and Splinter emerged from the shadows to say, “You are welcome.” The Sensei and his students had returned to make sure that Lynda was alright. Lynda recgnized Splinter’s voice as that of Hamato Yoshi’s. As she reached out to him, Splinter shied away, stating that he had changed greatly and she would not find it pleasant to see him. Lynda replied that looks didn’t matter, it was the soul that counted. She removed Splinter’s hat and kissed him on the forehead. The Sensei introduced his old friend to the Turtles, and as a reward for their bravery, Lynda offered each Turtle a choice of one weapon from her store. Unfortunately, the Turtles all wanted her boomerang – and she only had one. Back in the present, Splinter explains that eventually the Turtles were able to decide upon the weapons that they each now specialize in. As the pair walks in the sewer, they come to a familiar sewer grate. Splinter points to April and she peers through the bars – seeing that Ling’s Academy is now the successful first floor business of a sparkling new skyskraper in the revitalized neighborhood. Thus ends the monthly “TMNT Adventures” series. 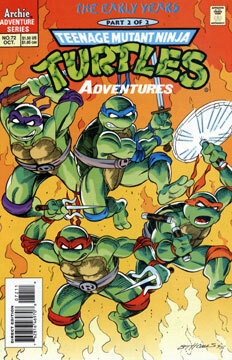 Additonal Material: 16 page TMNT story by Dean Clarrain and Don Simpson.